Six foot cake/ sweet table dressed with cohisive tablecloth & runner. X2 Personalised design giant balloons with foliage or tassel tail. Four tier bespoke wedding cake to your chosen design. See our wedding cake gallery. Choose from our delicious wedding cake flavours & fillings. Personalised cupcakes & cake pops. Check out our cupcake gallery for inspiration. Elegantly plated decorated biscuits, customised chocolates and sweet treats. See our sweet table wedding candy buffet gallery. Large and medium glass bon bon jars filled with sweets and treats to match your colour scheme. 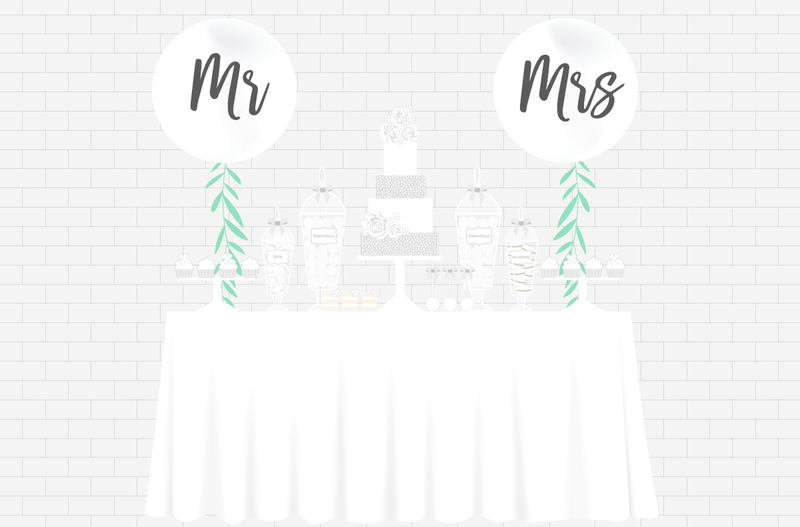 All Antonia’s candy buffets/ sweet tables are decorated with personalised sweet labels, ribbon detail and come with sweet scoops and treat bags. Thank your guests with our handmade favours. From french macarons and decorated cupcakes to candy floss and cake pops! Surprise your guests with a midnight snack, or end of night treat to take home. All our treats come in custom packaging with personalised labels/tags. Milk and cookies, doughnuts, popcorn boxes/cones for more examples see our favours page. 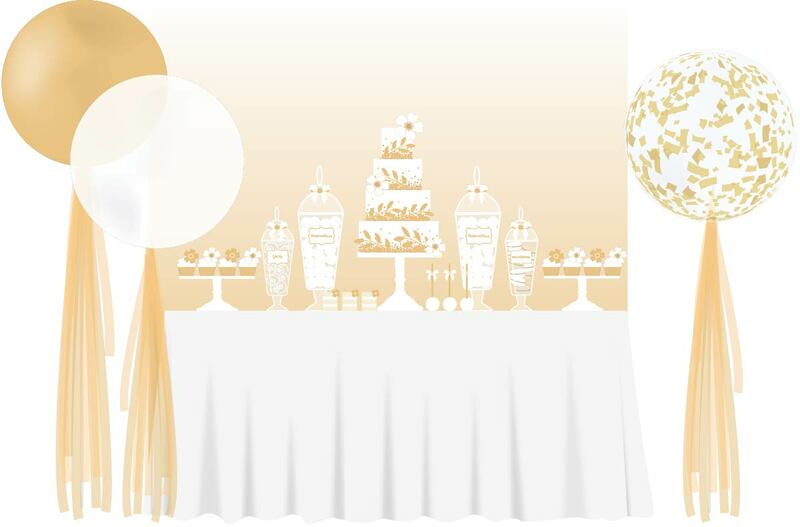 6ft Table decorated with tablecloth, runner and cake standes to match your event. 4 Tier wedding cake to your chosen bespoke design. See our wedding cake gallery for inspiration. Choose from any of our delicious wedding cake flavours and fillings. X2 Solid colour giant round 3ft balloons with tulle tail. X1 Clear Confetti filled giant round 3ft balloon with tulle tail. x2 Stands of personalised bespoke designed cupcakes. See our cupcake gallery for inspiration. Elegantly plated personalised biscuits, chocolates and sweet treats. See our sweet table wedding candy buffet gallery. Surprise your guests with an end of night treat personalised milk & cookies to take home. See our range of favours. For addition wedding cake tiers please contact us for a quote. Elegantly plated personalised biscuits, chocolates and sweet treats. View our candy buffet gallery. ribbon detail and come with sweet scoops and treat bags.